Popcorn Buffet Stations and dessert bars are fantastic ways of indulging your guests in fun activities and party favors. Popcorn buffets are very appropriate at outdoor events, corporate events, casual events, and weddings. 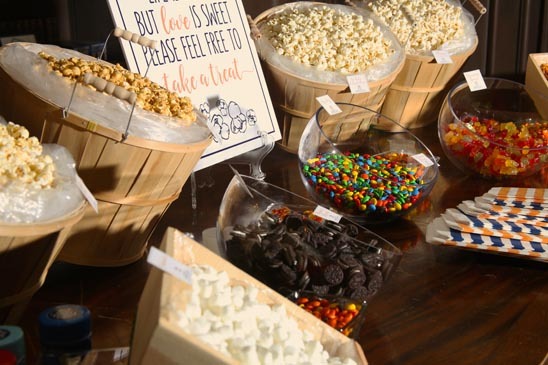 For those based in San Francisco, San Jose, Santa Clara, Burlingame, and the South Bay, SF Candy Bar, can help design and set up your desired popcorn buffet station! We curate delicious popcorn with a wide variety of flavors and even colors. We love popcorn! Dessert Bar Stations can also be the eye-catching focal point for any type of event. Consider adding some candy and perhaps some cake-stands to make the buffet stationslook more appealing on a table. At SF Candy Bar, we create customized dessert bars and popcorn buffet stationstheblend with the event style and our client’s demographic. We have a team of experts who can design and execute personalized sweets buffets stationsthat will surely make your guests swoon over our elegant designs. We are currently serving San Francisco, San Jose, Santa Clara, Burlingame, and South Bay areas. Looking for ways to enhance your guests’ event experience? Why not add buffet station such as dessert bars, popcorn buffets, and candy bars at your reception? SF Candy Bar is just a phone call away from providing you with strategic menus, dessert stations,and customized party favors (focusing on candy). Serving San Francisco, San Jose, Santa Clara, Burlingame, and South Bay areas, contact us today for free consultation! Popcorn Buffets starting at 75 guests. Planning to further spruce up your upcoming birthday parties with the best design dessert bar San Francisco, best design dessert bar San Jose, best design dessert bar Santa Clara, best design dessert bar Burlingame, best design dessert bar South Bay, best design dessert bar San Mateo, best dessert buffet San Francisco, best dessert buffet San Jose, best dessert buffet Santa Clara, best dessert buffet Burlingame, best dessert buffet South Bay, best dessert buffet San Mateo, best design popcorn buffet San Francisco, best design popcorn buffet San Jose, best design popcorn buffet Santa Clara, best design popcorn buffet Burlingame, best design popcorn buffet East Bay, best design popcorn buffet San Mateo, best design popcorn buffet station San Francisco, best design popcorn buffet station San Jose, best design popcorn buffet station Santa Clara, best design popcorn buffet station Burlingame, best design popcorn buffet station East Bay, best design dessert buffet station San Francisco, best design dessert buffet station San Jose, best design dessert buffet station Santa Clara, best design dessert buffet station Burlingame, best design dessert buffet station South Bay? Then why not get the amazing services of SF Candy Bar on creating only the best dessert bar San Francisco, best dessert bar San Jose, best dessert bar Santa Clara, best dessert bar Burlingame, best dessert bar South Bay, best dessert bar San Mateo, best dessert buffet San Francisco, best dessert buffet San Jose, best dessert buffet Santa Clara, best dessert buffet Burlingame, best dessert buffet South Bay, best dessert buffet San Mateo, best popcorn buffet San Francisco, best popcorn buffet San Jose, best popcorn buffet Santa Clara, best popcorn buffet Burlingame, best popcorn buffet East Bay, best popcorn buffet San Mateo, best popcorn buffet station San Francisco, best popcorn buffet station San Jose, best popcorn buffet station Santa Clara, best popcorn buffet station Burlingame, best popcorn buffet station East Bay, best dessert buffet station San Francisco, best dessert buffet station San Jose, best dessert buffet station Santa Clara, best dessert buffet station Burlingame, best dessert buffet station South Bay. One of the most beloved providers of delightful dessert bar San Francisco, dessert bar San Jose, dessert bar Santa Clara, dessert bar Burlingame, dessert bar South Bay, dessert bar San Mateo, dessert buffet San Francisco, dessert buffet San Jose, dessert buffet Santa Clara, dessert buffet Burlingame, dessert buffet South Bay, dessert buffet San Mateo, popcorn buffet San Francisco, popcorn buffet San Jose, popcorn buffet Santa Clara, popcorn buffet Burlingame, popcorn buffet East Bay, popcorn buffet San Mateo, popcorn buffet station San Francisco, popcorn buffet station San Jose, popcorn buffet station Santa Clara, popcorn buffet station Burlingame, popcorn buffet station East Bay, dessert buffet station San Francisco, dessert buffet station San Jose, dessert buffet station Santa Clara, dessert buffet station Burlingame, dessert buffet station South Bay, SF Candy Bar has the expertise and experience to deliver quality services. Putting up the best design dessert bar San Francisco, best design dessert bar San Jose, best design dessert bar Santa Clara, best design dessert bar Burlingame, best design dessert bar South Bay, best design dessert bar San Mateo, best dessert buffet San Francisco, best dessert buffet San Jose, best dessert buffet Santa Clara, best dessert buffet Burlingame, best dessert buffet South Bay, best dessert buffet San Mateo, best design popcorn buffet San Francisco, best design popcorn buffet San Jose, best design popcorn buffet Santa Clara, best design popcorn buffet Burlingame, best design popcorn buffet East Bay, best design popcorn buffet San Mateo, best design popcorn buffet station San Francisco, best design popcorn buffet station San Jose, best design popcorn buffet station Santa Clara, best design popcorn buffet station Burlingame, best design popcorn buffet station East Bay, best design dessert buffet station San Francisco, best design dessert buffet station San Jose, best design dessert buffet station Santa Clara, best design dessert buffet station Burlingame, best design dessert buffet station South Bay is no easy feat. Hence, you need the expertise and experience of a trusted best dessert bar San Francisco, best dessert bar San Jose, best dessert bar Santa Clara, best dessert bar Burlingame, best dessert bar South Bay, best dessert bar San Mateo, best dessert buffet San Francisco, best dessert buffet San Jose, best dessert buffet Santa Clara, best dessert buffet Burlingame, best dessert buffet South Bay, best dessert buffet San Mateo, best popcorn buffet San Francisco, best popcorn buffet San Jose, best popcorn buffet Santa Clara, best popcorn buffet Burlingame, best popcorn buffet East Bay, best popcorn buffet San Mateo, best popcorn bar buffet station San Francisco, best popcorn bar buffet station San Jose, best popcorn bar buffet station Santa Clara, best popcorn bar buffet station Burlingame, best popcorn bar buffet station East Bay, best dessert buffet station San Francisco, best dessert buffet station San Jose, best dessert buffet station Santa Clara, best dessert buffet station Burlingame, best dessert buffet station South Bay provider. And we, at the SF Candy Bar, delivers the most amazing, delightful, and delicious dessert bar San Francisco, dessert bar San Jose, dessert bar Santa Clara, dessert bar Burlingame, dessert bar South Bay, dessert bar San Mateo, dessert buffet San Francisco, dessert buffet San Jose, dessert buffet Santa Clara, dessert buffet Burlingame, dessert buffet South Bay, dessert buffet San Mateo, popcorn buffet San Francisco, popcorn buffet San Jose, popcorn buffet Santa Clara, popcorn buffet Burlingame, popcorn buffet East Bay, popcorn buffet San Mateo, popcorn buffet station San Francisco, popcorn buffet station San Jose, popcorn buffet station Santa Clara, popcorn buffet station Burlingame, popcorn buffet station East Bay, dessert buffet station San Francisco, dessert buffet station San Jose, dessert buffet station Santa Clara, dessert buffet station Burlingame, dessert buffet station South Bay. With our best dessert bar San Francisco, best dessert bar San Jose, best dessert bar Santa Clara, best dessert bar Burlingame, best dessert bar South Bay, best dessert bar San Mateo, best dessert buffet San Francisco, best dessert buffet San Jose, best dessert buffet Santa Clara, best dessert buffet Burlingame, best dessert buffet South Bay, best dessert buffet San Mateo, best popcorn buffet San Francisco, best popcorn buffet San Jose, best popcorn buffet Santa Clara, best popcorn buffet Burlingame, best popcorn buffet East Bay, best popcorn buffet San Mateo, best popcorn buffet station San Francisco, best popcorn buffet station San Jose, best popcorn buffet station Santa Clara, best popcorn buffet station Burlingame, best popcorn buffet station East Bay, best dessert buffet station San Francisco, best dessert buffet station San Jose, best dessert buffet station Santa Clara, best dessert buffet station Burlingame, best dessert buffet station South Bay, guests can indulge in fun social interactions while enjoyably munching your sweet desserts. At SF Candy Bar, to ensure that we produce only the best design dessert bar San Francisco, best design dessert bar San Jose, best design dessert bar Santa Clara, best design dessert bar Burlingame, best design dessert bar South Bay, best design dessert bar San Mateo, best dessert buffet San Francisco, best dessert buffet San Jose, best dessert buffet Santa Clara, best dessert buffet Burlingame, best dessert buffet South Bay, best dessert buffet San Mateo, best design popcorn buffet San Francisco, best design popcorn buffet San Jose, best design popcorn buffet Santa Clara, best design popcorn buffet Burlingame, best design popcorn buffet East Bay, best design popcorn buffet San Mateo, best design popcorn buffet station San Francisco, best design popcorn buffet station San Jose, best design popcorn buffet station Santa Clara, best design popcorn buffet station Burlingame, best design popcorn buffet station East Bay, best design dessert buffet station San Francisco, best design dessert buffet station San Jose, best design dessert buffet station Santa Clara, best design dessert buffet station Burlingame, best design dessert buffet station South Bay, we have a team of creative experts whose commitment on creating the best dessert bar San Francisco, best dessert bar San Jose, best dessert bar Santa Clara, best dessert bar Burlingame, best dessert bar South Bay, best dessert bar San Mateo, best dessert buffet San Francisco, best dessert buffet San Jose, best dessert buffet Santa Clara, best dessert buffet Burlingame, best dessert buffet South Bay, best dessert buffet San Mateo, best popcorn buffet San Francisco, best popcorn buffet San Jose, best popcorn buffet Santa Clara, best popcorn buffet Burlingame, best popcorn buffet East Bay, best popcorn buffet San Mateo, best popcorn buffet station San Francisco, best popcorn buffet station San Jose, best popcorn buffet station Santa Clara, best popcorn buffet station Burlingame, best popcorn buffet station East Bay, best dessert buffet station San Francisco, best dessert buffet station San Jose, best dessert buffet station Santa Clara, best dessert buffet station Burlingame, best dessert buffet station South Bay is truly unparalleled. We also work with our clients all throughout the process of making the dessert bar San Francisco, dessert bar San Jose, dessert bar Santa Clara, dessert bar Burlingame, dessert bar South Bay, dessert bar San Mateo, dessert buffet San Francisco, dessert buffet San Jose, dessert buffet Santa Clara, dessert buffet Burlingame, dessert buffet South Bay, dessert buffet San Mateo, popcorn buffet San Francisco, popcorn buffet San Jose, popcorn buffet Santa Clara, popcorn buffet Burlingame, popcorn buffet East Bay, popcorn buffet San Mateo, popcorn buffet station San Francisco, popcorn buffet station San Jose, popcorn buffet station Santa Clara, popcorn buffet station Burlingame, popcorn buffet station East Bay, dessert buffet station San Francisco, dessert buffet station San Jose, dessert buffet station Santa Clara, dessert buffet station Burlingame, dessert buffet station South Bay. From selecting the designs and flavors until setting up the best dessert bar San Francisco, best dessert bar San Jose, best dessert bar Santa Clara, best dessert bar Burlingame, best dessert bar South Bay, best dessert bar San Mateo, best dessert buffet San Francisco, best dessert buffet San Jose, best dessert buffet Santa Clara, best dessert buffet Burlingame, best dessert buffet South Bay, best dessert buffet San Mateo, best popcorn buffet San Francisco, best popcorn buffet San Jose, best popcorn buffet Santa Clara, best popcorn buffet Burlingame, best popcorn buffet East Bay, best popcorn buffet San Mateo, best popcorn buffet station San Francisco, best popcorn buffet station San Jose, best popcorn buffet station Santa Clara, best popcorn buffet station Burlingame, best popcorn buffet station East Bay, best dessert buffet station San Francisco, best dessert buffet station San Jose, best dessert buffet station Santa Clara, best dessert buffet station Burlingame, best dessert buffet station South Bay, we’ve got you covered. Our dessert bar San Francisco, dessert bar San Jose, dessert bar Santa Clara, dessert bar Burlingame, dessert bar South Bay, dessert bar San Mateo, dessert buffet San Francisco, dessert buffet San Jose, dessert buffet Santa Clara, dessert buffet Burlingame, dessert buffet South Bay, dessert buffet San Mateo, popcorn buffet San Francisco, popcorn buffet San Jose, popcorn buffet Santa Clara, popcorn buffet Burlingame, popcorn buffet East Bay, popcorn buffet San Mateo, popcorn buffet station San Francisco, popcorn buffet station San Jose, popcorn buffet station Santa Clara, popcorn buffet station Burlingame, popcorn buffet station East Bay, dessert buffet station San Francisco, dessert buffet station San Jose, dessert buffet station Santa Clara, dessert buffet station Burlingame, dessert buffet station South Bay will surely make your party more enjoyable and unforgettable! Say no more to boring parties and get our services on creating the best dessert bar San Francisco, dessert bar San Jose, dessert bar Santa Clara, dessert bar Burlingame, dessert bar South Bay, dessert bar San Mateo, dessert buffet San Francisco, dessert buffet San Jose, dessert buffet Santa Clara, dessert buffet Burlingame, dessert buffet South Bay, dessert buffet San Mateo, popcorn buffet San Francisco, popcorn buffet San Jose, popcorn buffet Santa Clara, popcorn buffet Burlingame, popcorn buffet East Bay, popcorn buffet San Mateo, popcorn buffet station San Francisco, popcorn buffet station San Jose, popcorn buffet station Santa Clara, popcorn buffet station Burlingame, popcorn buffet station East Bay, dessert buffet station San Francisco, dessert buffet station San Jose, dessert buffet station Santa Clara, dessert buffet station Burlingame, dessert buffet station South Bay! Our eye-catching dessert bar San Francisco, dessert bar San Jose, dessert bar Santa Clara, dessert bar Burlingame, dessert bar South Bay, dessert bar San Mateo, dessert buffet San Francisco, dessert buffet San Jose, dessert buffet Santa Clara, dessert buffet Burlingame, dessert buffet South Bay, dessert buffet San Mateo, popcorn buffet San Francisco, popcorn buffet San Jose, popcorn buffet Santa Clara, popcorn buffet Burlingame, popcorn buffet East Bay, popcorn buffet San Mateo, popcorn buffet station San Francisco, popcorn buffet station San Jose, popcorn buffet station Santa Clara, popcorn buffet station Burlingame, popcorn buffet station East Bay, dessert buffet station San Francisco, dessert buffet station San Jose, dessert buffet station Santa Clara, dessert buffet station Burlingame, dessert buffet station South Bay can be the focal point of your reception, which can then start conversations among your guests. And of course, aside from ensuring that our dessert bar San Francisco, dessert bar San Jose, dessert bar Santa Clara, dessert bar Burlingame, dessert bar South Bay, dessert bar San Mateo, dessert buffet San Francisco, dessert buffet San Jose, dessert buffet Santa Clara, dessert buffet Burlingame, dessert buffet South Bay, dessert buffet San Mateo, popcorn buffet San Francisco, popcorn buffet San Jose, popcorn buffet Santa Clara, popcorn buffet Burlingame, popcorn buffet East Bay, popcorn buffet San Mateo, popcorn buffet station San Francisco, popcorn buffet station San Jose, popcorn buffet station Santa Clara, popcorn buffet station Burlingame, popcorn buffet station East Bay, dessert buffet station San Francisco, dessert buffet station San Jose, dessert buffet station Santa Clara, dessert buffet station Burlingame, dessert buffet station South Bay are aesthetically pleasing, these are also sumptuous. With our dessert bar San Francisco, dessert bar San Jose, dessert bar Santa Clara, dessert bar Burlingame, dessert bar South Bay, dessert bar San Mateo, dessert buffet San Francisco, dessert buffet San Jose, dessert buffet Santa Clara, dessert buffet Burlingame, dessert buffet South Bay, dessert buffet San Mateo, popcorn buffet San Francisco, popcorn buffet San Jose, popcorn buffet Santa Clara, popcorn buffet Burlingame, popcorn buffet East Bay, popcorn buffet San Mateo, popcorn buffet station San Francisco, popcorn buffet station San Jose, popcorn buffet station Santa Clara, popcorn buffet station Burlingame, popcorn buffet station East Bay, dessert buffet station San Francisco, dessert buffet station San Jose, dessert buffet station Santa Clara, dessert buffet station Burlingame, dessert buffet station South Bay, not only your guests eyes will be pleased but also, their sweet tooth will be delighted. Let SF Candy Bar create the most perfect dessert bar San Francisco, dessert bar San Jose, dessert bar Santa Clara, dessert bar Burlingame, dessert bar South Bay, dessert bar San Mateo, dessert buffet San Francisco, dessert buffet San Jose, dessert buffet Santa Clara, dessert buffet Burlingame, dessert buffet South Bay, dessert buffet San Mateo, popcorn buffet San Francisco, popcorn buffet San Jose, popcorn buffet Santa Clara, popcorn buffet Burlingame, popcorn buffet East Bay, popcorn buffet San Mateo, popcorn buffet station San Francisco, popcorn buffet station San Jose, popcorn buffet station Santa Clara, popcorn buffet station Burlingame, popcorn buffet station East Bay, dessert buffet station San Francisco, dessert buffet station San Jose, dessert buffet station Santa Clara, dessert buffet station Burlingame, dessert buffet station South Bay for your upcoming event! Visit our website to get a glimpse of the dessert bar San Francisco, dessert bar San Jose, dessert bar Santa Clara, dessert bar Burlingame, dessert bar South Bay, dessert bar San Mateo, dessert buffet San Francisco, dessert buffet San Jose, dessert buffet Santa Clara, dessert buffet Burlingame, dessert buffet South Bay, dessert buffet San Mateo, popcorn buffet San Francisco, popcorn buffet San Jose, popcorn buffet Santa Clara, popcorn buffet Burlingame, popcorn buffet East Bay, popcorn buffet San Mateo, popcorn buffet station San Francisco, popcorn buffet station San Jose, popcorn buffet station Santa Clara, popcorn buffet station Burlingame, popcorn buffet station East Bay, dessert buffet station San Francisco, dessert buffet station San Jose, dessert buffet station Santa Clara, dessert buffet station Burlingame, dessert buffet station South Bay that we currently offer.